Vienna, the most liveable city of 2018, is the gateway between Western and Eastern Europe and lies beautifully at the banks of the Danube river. Vienna is one of the worlds most favoured tourist destinations and one of the most visited European capitals. This comes as no surprise since Vienna offers a rich variety between various great historic sights and its new modern-day cosmopolitan atmosphere. So, let me introduce you to the must-see sights for a weekend getaway to Vienna. First and foremost, the easiest way to get around the city is the well-connected metro system. 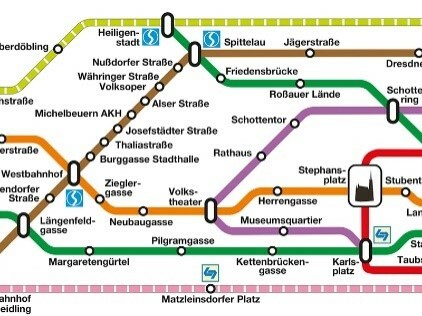 Most of the important sights lie on the lines of either U3 (orange) or U2 (purple) with the exception of Schönnbrunn Palace which is reachable via the U4 (green). A 72h ticket will cost you 17,10€ and a 48h ticket 14,10€ and allows you to take tram, bus and metro around the city as much and often as you please. Since a weekend getaway is just a short amount of time, I will introduce you to the sights of Vienna in a way that you can easily manage to see everything in two days without any stress. As stated above, the U3 is one of your safest bets, you can start of your day at Westbahnhof and continue walking down Vienna’s biggest shopping street, the Mariahhilfer Straße (Mahü) which ultimately will lead you to the Museums Quartier (MQ) which is a hotspot for art museums and its big terraces invite you to enjoy cold beverages in the sun. The MQ (U2) is then just across the street of the beautiful Maria-Theresien Platz which is surrounded by two museums that are definitely worth a visit but also just gorgeous from the outside. If youre not tired yet and still got some energy inside you, you can yet again cross the street to enter the massive Hofburg. The Hofburg used to be the seat of the Habsburgs and is the residence of every Austrian ruler since the early 13th century. With its massive 59 acres and 18 groups of buildings and 19 courtyards it is definitely a jaw dropper. Afterwards, the prestigious Kärntner Straße awaits you with its high-priced shops and fancy bars and restaurants. So, after a nice stroll through the Kärtner Straße you will end up at your last touristic must-see spot of the day, the St. Stephens Cathedral (U3/U2/U1), Vienna’s most important gothic cathedral. Luckily, after having seen all of this, you are just a five-minute walk away from Schwedenplatz (U4/U1) and its famous Bermuda Triangle. 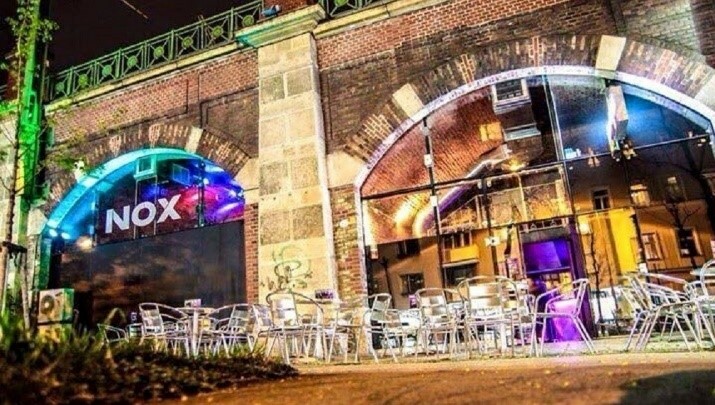 The Bermuda Triangle is home to lots of student bars and clubs that offer cheap cocktails and drinks throughout the night and are the starting point for every Viennese for a successful night out. Furthermore, the Stadtbahnbögen, starting at U6 Thaliastraße upwards are home to over 20 different clubs. If the hangover isn’t too big the next morning, be sure to go via the U4 to Schönnbrunn Palace, the impressive palace of Kaiser Franz and Empress Sisi. Its impressive architecture and its massive gardens are definitely worth a visit and you should at least plan half a day for this. To end the day, be sure not to miss the Ring Straße, getting off at U2 Schottentor, you will directly see the over 600-year-old University of Vienna, followed by the magnificent city hall and opposite of it the national theatre. Afterwards you should absolutely stroll by the Austrian parliament building and then make sure to head up to the seventh district with its small typical Austrian bars. Most importantly, be sure to always check out Vienna’s side streets, since that’s where the real treasures in regards to restaurants and bars are where you don’t pay tourist prices. Overall, be sure to check what’s happening in Vienna on the weekend of your choosing. It is a vibrant city, which is proud of its cultural heritage, so there are lots of free music festivals, free entries to museums and culinary events that happen almost weekly. 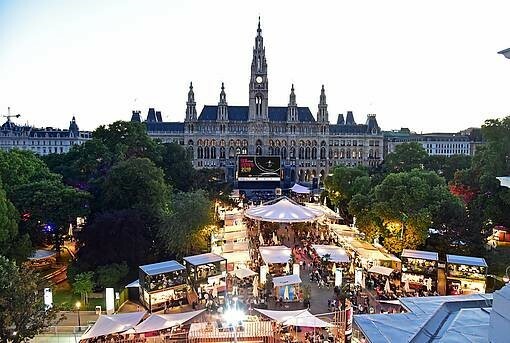 One of the safest spots is the park in front of the Vienna City Hall, with events ranging from open air cinema, to culinary events, Christmas markets and ice-skating rings. The easiest way to reach Vienna is via Bus, Flixbus offers the route Budapest (Nepliget/Kelenföld) -Vienna about twenty times daily from prices starting at 9,99€. A little comfier is the train, with prices starting at 20€. And if you feel really fancy, Austrian Airlines offers flights starting at 190€ and gets you to Vienna within 45 minutes.